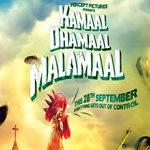 Download Kamaal Dhamaal Malamaal (2012) Songs. Kamaal Dhamaal Malamaal is directed by Priyadarshan. Music Composed by Sajid, Wajid and its release date is September 28, 2012. Kamaal Dhamaal Malamaal is a 2012 Movie and it contains 9 Mp3 Songs that can be downloaded below. You Need Winzip to Unzip these Song files. Notice: Our Site or Web Servers only have the Kamaal Dhamaal Malamaal Songs information. We don't host any file. The users provide file sources that are hosted on free hosts. If you think that the information provided on this page breach your Copyrights then you can request for a removal for this information. Send a Proper DMCA Notice by using our contact page.